a total of 12 monthly club competition tournaments will be held in 2019, where participants earn "master points", depending on final placing of each tournament. See home page for dates. ​Mark your calendars. Entry to all events not required, however the more events entered increases chances of winning. The format 5 -7 point matches. Prizes from entry will be awarded from 1st to 4th place. Entry includes member participation, use of premises, and equipment, prizes. New Division for Novices -Beginner 2019. Events will feature an additional separate tournament for those who are Novices , new to the game, or have not played in sometime. 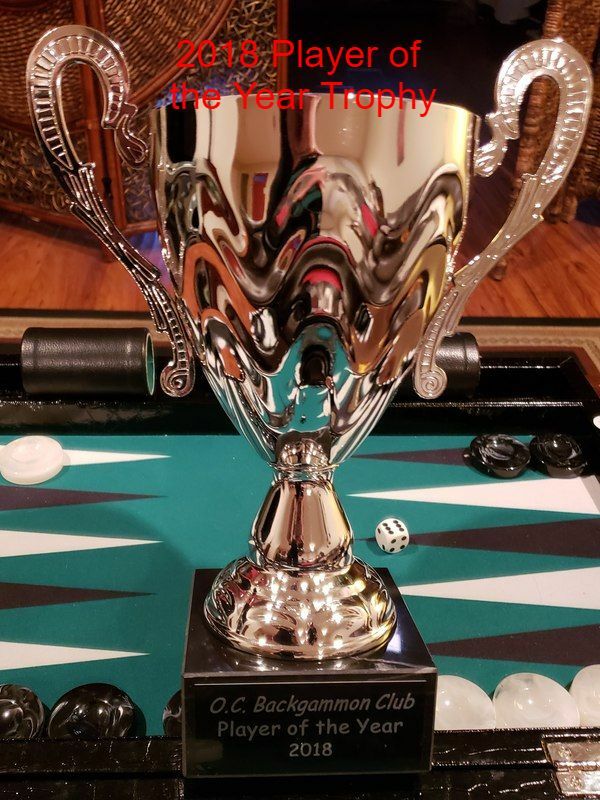 At the conclusion of the 12 tournaments in 2019, the player accumulating most master points, will be the Orange County Backgammon's Player of the Year. At the conclusion of the 12 monthly tournaments, the top 8 finishers in the standings will be invited to compete in one additional & final showdown event of the year. Single elimination 9 point matches with an 11 point final.